The most powerful of the kings of Damascus, and a ruler of general historical as well as of Biblical importance. While Ahab was still reigning as King of Israel the prophet Elijah was ordered by Yhwh to anoint Hazael as the coming King of Damascus (I Kings xix. 15). At this time Ben-hadad II was at the height of his power. It is not mentioned whether Elijah was able to carry out this difficult and dangerous commission; but in anycase the prophetic and reforming party in Israel had a share in the promotion of Hazael's ambition. When Joram, the successor of Ahab, was near the end of his reign (about 845 B.C. ), Ben-hadad fell sick, and sent Hazael to Elisha, the successor of Elijah, to inquire as to the issue of his sickness. Elisha told Hazael in reply that his master would not recover, and predicted to him that he himself would be the next king, and would wage war against Israel with relentless cruelty. Hazael upon his return assassinated Ben-hadad and seized the throne (II Kings viii. 7-15). 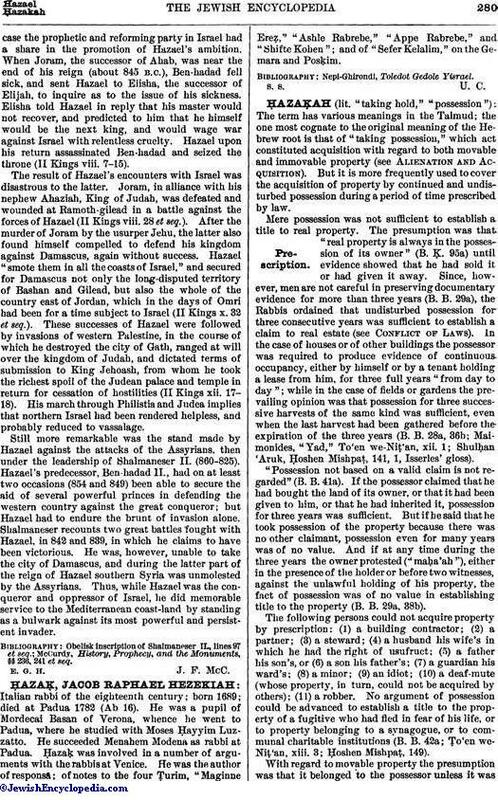 The result of Hazael's encounters with Israel was disastrous to the latter. Joram, in alliance with his nephew Ahaziah, King of Judah, was defeated and wounded at Ramoth-gilead in a battle against the forces of Hazael (II Kings viii. 28 et seq.). After the murder of Joram by the usurper Jehu, the latter also found himself compelled to defend his kingdom against Damascus, again without success. 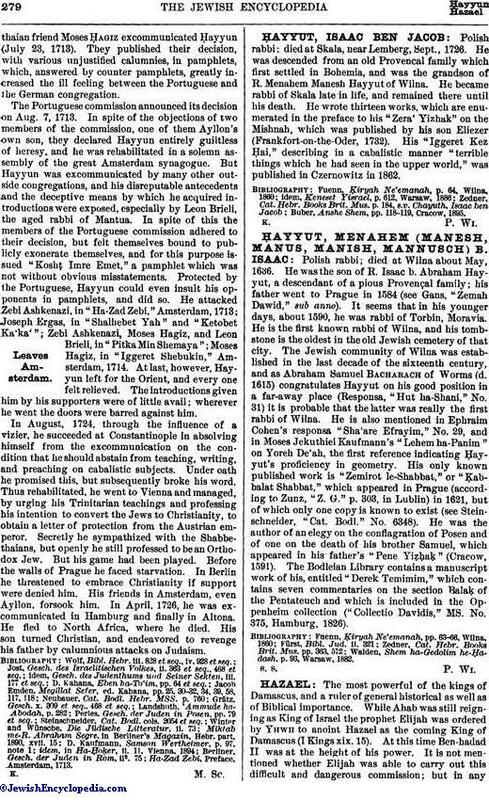 Hazael "smote them in all the coasts of Israel," and secured for Damascus not only the long-disputed territory of Bashan and Gilead, but also the whole of the country east of Jordan, which in the days of Omri had been for a time subject to Israel (II Kings x. 32 et seq.). These successes of Hazael were followed by invasions of western Palestine, in the course of which he destroyed the city of Gath, ranged at will over the kingdom of Judah, and dictated terms of submission to King Jehoash, from whom he took the richest spoil of the Judean palace and temple in return for cessation of hostilities (II Kings xii. 17-18). His march through Philistia and Judea implies that northern Israel had been rendered helpless, and probably reduced to vassalage. Still more remarkable was the stand made by Hazael against the attacks of the Assyrians, then under the leadership of Shalmaneser II. (860-825). Hazael's predecessor, Ben-hadad II., had on at least two occasions (854 and 849) been able to secure the aid of several powerful princes in defending the western country against the great conqueror; but Hazael had to endure the brunt of invasion alone. Shalmaneser recounts two great battles fought with Hazael, in 842 and 839, in which he claims to have been victorious. He was, however, unable to take the city of Damascus, and during the latter part of the reign of Hazael southern Syria was unmolested by the Assyrians. Thus, while Hazael was the conqueror and oppressor of Israel, he did memorable service to the Mediterranean coast-land by standing as a bulwark against its most powerful and persistent invader. McCurdy, History, Prophecy, and the Monuments, §§ 236, 241 et seq. E. G. H. J. F. McC.